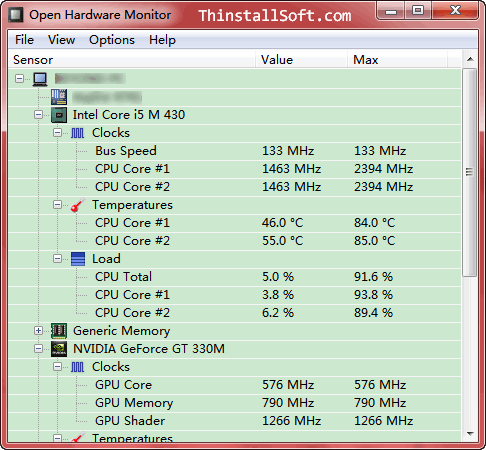 Open Hardware Monitor is a free software to monitor the temperature, fan speeds, voltages, load and clock speeds of a computer. It could get the status of your PC hardware including CPU, Mainboard, GPU, RAM, Hard Disk Drives and Fan Controllers. Note: Run OpenHardwareMonitor.exe to launch Open Hardware Monitor Portable. The current version is Open Hardware Monitor 0.6.0 Beta. The settings will be saved to the OpenHardwareMonitor.config file. However, You must install the .NET Framework version 2.0 to run it. To monitor system status, you could also try AIDA64, NetWorx and Performance Monitor. What's new in Open Hardware Monitor 0.6.0 Beta? Added a new plotting implementation using a .NET 2.0 backport of the OxyPlot library. All types of sensors can now be added to the plot. The plot can be configured to use stacked axes instead of subplots for each sensor type. The plot supports automatic or manual plot region selection. Added support for Intel Haswell CPUs. Added support for AMD family 15h model 1Xh and family 16h CPUs. Added support for the Fintek F71869A (F71868AD) super I/O chip. Added support for new Samsung SSDs (like Samsung SSD 840 PRO). Added support for fan control on ITE 87XX chips and a mainboard specific configuration for the Gigabyte GA 970A UD3 (both based on a patch from Eric Hokanson). Changed the HDD detection to list hard drives without SMART support as well. Enabled fan control on mainboards by default. Improved the kernel driver loading code. Added additional information from the SMBIOS to the report. Fixed some stability issues in the remote web server implementation. Fixed a stability issue in the WMI provider implementation. Extended the list of supported super I/O chips on Linux using the lm-sensors interface. Reduced the amount of dynamic memory allocation. This entry was posted in System Utilities and tagged cpu fan speed, CPU Monitor, Disk Monitor, fan speed monitor, gpu fan speed, gpu monitor, hardware monitor, mainboard monitor, Memory Monitor, nvidia fan speed, open hardware monitor, pc monitor, temperature monitor. Bookmark the permalink.